Tanuki (狸 or タヌキ, Tanuki) is the Japanese word for the Japanese raccoon dog (Nyctereutes procyonides viverrinus). They have been part of Japanese folklore since ancient times. The legendary tanuki is reputed to be mischievous and jolly, a master of disguise and shapeshifting, but somewhat gullible and absent-minded. Tanuki is often mistakenly translated as raccoon or badger. Statues of tanuki can be found outside many Japanese temples and restaurants, especially noodle shops. These statues often wear big, cone-shaped hats and carry bottles of sake in one hand, and a promissory note or empty purse in the other hand. Tanuki statues always have large bellies. The statues also usually show humorously large testicles, typically hanging down to the floor or ground, although this feature is sometimes omitted in contemporary sculpture. Organizers chose November 8 as the date for the Tanuki holiday because the emperor made his famous visit in November and because the tanuki has eight special traits that bring good fortune. The eight traits are: (1) a bamboo hat that protects against trouble, (2) big eyes to perceive the environment and help make good decisions, (3) a sake bottle that represents virtue, (4) a big tail that provides steadiness and strength until success is achieved, (5) over-sized testicles that symbolize financial luck, (6) a promissory note that represents trust, (7) a big belly that symbolizes bold decisiveness, and (8) a friendly smile. The comical image of the tanuki is thought to have developed during the Kamakura era. The actual wild tanuki has unusually large testicles, a feature that has inspired humorous exaggeration in artistic depictions of the creature. Tanuki may be shown with their testicles flung over their backs like travellers' packs, or using them as drums. As tanuki are also typically depicted as having large bellies, they may be depicted as drumming on their bellies instead of their testicles -- particularly in contemporary art. Roughly translated, this means "Tan-tan-tanuki's testicles, there isn't even any wind but still go swing-swing-swing." It then proceeds to continue for several verses, with many regional variations. It is sung to the melody of an American Baptist hymn called "Shall We Gather At The River?". Tanuki statues at a temple in Kamakura, Kanagawa, Japan. During the Kamakura and Muromachi eras, some stories began to include more sinister tanuki. The Otogizoshi story of "Kachi-kachi Yama" features a tanuki that clubs an old lady to death and serves her to her unknowing husband as "old lady soup," an ironic twist on the folkloric recipe known as "tanuki soup." Other stories report tanuki as being harmless and productive members of society. Several shrines have stories of past priests who were tanuki in disguise. Shapeshifting tanuki are sometimes believed to be tsukumogami, a transformation of the souls of household goods that were used for one hundred years or more. In metalworking, tanuki skins were often used for thinning gold. As a result, tanuki became associated with precious metals and metalwork. Small tanuki statues were marketed as front yard decoration and good luck charm for bringing in prosperity. Also, this is why tanuki is described as having large kintama (金玉 lit. gold ball, means a testicle in Japanese slang). While tanuki are prominent in Japanese folklore and proverbs, they were not always distinguished from other animals. 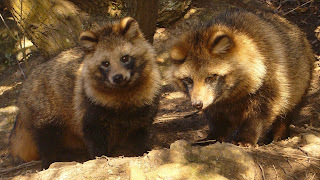 In local dialects, tanuki and mujina (狢, kyujitai: 貉) can refer to raccoon dogs or badgers. An animal known as tanuki in one region may be known as mujina in another region. In modern Tokyo standard dialect, tanuki refers to raccoon dogs and anaguma refers to badgers. Regional dishes known as tanuki-jiru ("tanuki soup") may contain either raccoon dog or badger, although the taste of the latter is often preferred. Originally, the kanji for tanuki, 狸 (kyujitai: 貍) was used to refer to other mid-sized mammals, mostly wild cats. Since wild cats live only in limited regions of Japan (e.g. Iriomote, Okinawa), it is believed that the characters began to be used to mean "tanuki" instead starting around the Japanese feudal era. This shift in meaning, along with the rarity of the raccoon dog outside Japan, may have contributed to confusion over the proper translation of "tanuki" into other languages. In Japanese slang, tanuki gao ("tanuki face") can refer to a face that looks like that of the animal, or a person's facial expression of feigned ignorance. Kitsune gao ("fox face") refers to women with narrow faces, close-set eyes, thin eyebrows and high cheekbones. The word "tanuki" is sometimes used as a Japanese code. It is a play on ta-nuki. Because "nuki" means "take out", the reader must remove the "ta"'s from the message. Tanuki appear in numerous anime, manga and video games. All the main characters in Pom Poko are shape-shifting tanuki who are trying to save their habitat from urban development. Japanese legends about tanuki and kitsune shapeshifting feature heavily throughout the movie. The tanuki were mis-translated in the film as raccoons. Hachi, from the anime series InuYasha, takes the form of a tanuki, though he is introduced as a badger in the English dub. Urusei Yatsura, which was written by the same author as InuYasha (Rumiko Takahashi) also features a tanuki in comical situations. In Naruto, the one-tailed demon Shukaku that is sealed inside the body of Gaara is based on the Tanuki. The tanuki is well represented in video games as one of Mario's power-up suits in Super Mario Bros. 3, a pair of characters in Super Mario Sunshine, the action stage identifier from The Legend of the Mystical Ninja and Rocky from Pocky & Rocky. Tom Nook, the shopkeeper in Animal Crossing, is a tanuki (although translated as a raccoon) and the furniture and other objects that he buys and sells transform into leaves when stored in a player's inventory. A tanuki is a main character in Tom Robbins' novel Villa Incognito. The Masked Tanuki is an episode of the American animated television show Kappa Mikey and also the name of the superhero identity of one of the show's characters. Tanuki also appear in the 2005 Seijun Suzuki film Princess Raccoon (aka Operetta tanuki goten). In Ever17 Visual Novel by KID Komachi Tsugumi wears a mascot tanuki suit and beats the protagonist pretty hard when he tries to seek the help from her, when he gets lost in amusement park. Later, Yuubiseiharukana explains that isn't a 'tanuki', but 'lemur'. In the manga/anime Shaman King, one of Tamao Tamamura's guardian ghosts is a Tanuki (Ponchi). In the videogame Okami, Tanuki statues can be seen in front of various shops. http://www.JapanFriends.jp - Make a Friend in Japan! I live in Shiga prefecture,where has a famous town known as the producing center of tanuki statues,Shigaraki. Have you ever been to Shigaraki? There are so many tanuki statues everywhere in the town! It's very rural around our town so we can see foxes and tanuki here and there.